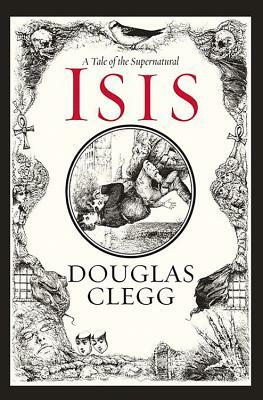 A few weeks ago, I read Douglas Clegg's Neverland for a review on Bookgasm. This was horror writing as I always wished it could be, standing on its own two feet sans gimmicks and hooks and cliche plot twists. Creepy, haunting, well-written, imaginative, the works. So of course, I scanned my shelves for something to satisfy my new desire for more horror and came across a galley copy of Isis, part of last year's BEA haul. It's signed to me and everything. Isis: A Tale of the Supernatural is a slim volume, ranking more as a novella than a novel, with line illustrations by Glenn Chadbourne, who also did the artwork for Neverland. The back-cover text for the book asks, "If you lost someone you loved, what would you pay to bring them back from the dead?" A perfect tagline for this charmingly creepy little book. As a child's game becomes deadly and the characters of Isis and Osiris become a reality, Iris Villiers finds herself asking that very question. Ignoring the warnings of their loyal family gardener, she turns to the occult and the family Tombs to change the course of life. Bottom line: Chadbourne's illustrations fit Clegg's text perfectly, and both combined have created an atmosphere of impending doom that starts on page 1. This is the kind of book that makes you feel unseen eyes watching you at all hours, and will leave readers satisfyingly full of more questions at the end than the beginning. Note: I received a copy of this book from the publisher at BEA 2009. And I also met the author there, albeit briefly as one in a long line of fans requesting signatures.